Extent blocks are used for any file that has more than a single extent. 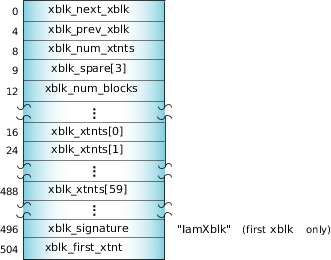 The i_xblk field in the directory entry points to one of these extent blocks, which in turn defines where the second and subsequent extents are to be found. Figure 1. An extent block. The first extent block also contains a redundant pointer to the first file extent (also described within the directory/inode entry). This lets you recover all data in the file by locating this block alone.